Hi everyone! 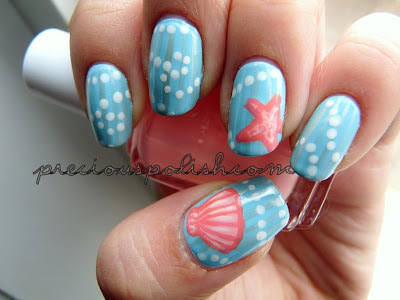 I have some more summer-appropriate nail art for you. It's a simple mix-and-match look using two American Apparel polishes that I hauled the other day. I thought they went so well together that I knew I had to use them right away. American Apparel The Valley, that's the blue colour, applied flawlessly in two coats. American Apparel Sunset Blvd. was a bit more finicky. It didn't seem to want to even out so it took three coats. It could just be the fault of the polisher though (ie. me) and it's otherwise no problem at all. I highly recommend both for go-to summer shades! On the index and little fingers I used American Apparel Sunset Blvd. On the rest of the nails I used American Apparel The Valley. 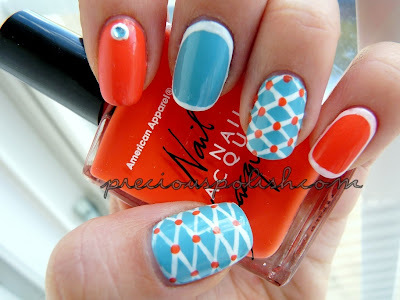 For the white details I used a striping polish, a dotting tool for the orange dots, and added an light blue rhinestone on my index finger. I started off with Sally Hansen Insta-Dri Blue-Away. I painted the subtle pinstripes with a sheer pearly striping polish. Then I painted the starfish and the shell with Essie Van D'Go, mixed that with white to highlight and Essie Tart Deco to shade. Then I used OPI Alpine Snow and a dotting tool for the pearl strands. 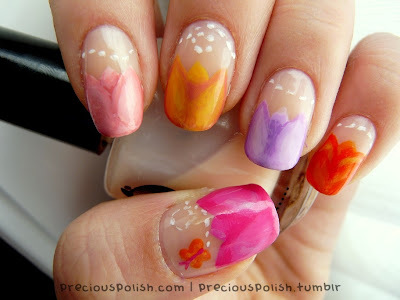 These are my nails for this Easter weekend. Not quite Easter-y but I was inspired by some yellow tulips that my mom bought for the occasion. I've never really done nail art like this before. I'm usually more into flat patterns and geometric things so this was a bit of a challenge. I tried to shade the tulips and give them some dimension but they didn't turn out quite how I wanted. The idea was better in my mind and I don't think I was able to make it clear enough on the nails. I started off with Seche Chemise on all nails. I painted on everything else with a small nail art brush. For highlights I mixed the base colour of each tulip with white. For the thumb I used Quo by Orly True Love and shaded with OPI Kiss Me On My Tulips (how appropriate). On the index finger I used Essie Van D'Go, shaded with American Apparel Rose Bowl. On the middle finger I used American Apparel Manila and mixed it with American Apparel Rose Bowl to shade. On the ring finger I used China Glaze Sweet Hook and shaded with Essie Play Date. 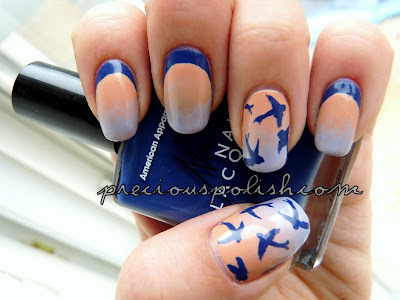 For the little finger and the butterfly I used China Glaze Breakin' and OPI A Roll In The Hague. I used American Apparel California Trooper as a base on my thumb and ring finger and OPI San Tan-Tonio on the rest. The blue parts are a blue striping polish by Art Club. For the triangular halfmoons I mapped out the shape with the striping polish, filled in the triangle with American Apparel California Trooper and then freehanded the design. For the fishtail, see below! 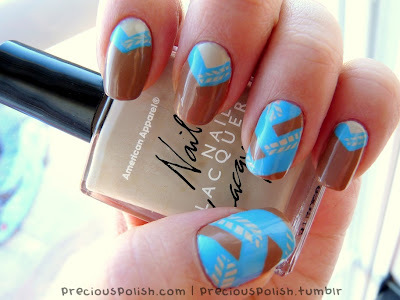 Paint the nail with a light coloured polish. Use a striping brush to map out the fishtail with an opaque polish. Use light strokes starting from the top free edge of the nail to the opposite side on a diagonal. Repeat this process, alternating direction, to the cuticle. Use a contrasting opaque polish to fill in one of the sections. From there, fill in the very next section that doesn't touch the first filled-in section. Repeat this down the nail and see the photo if you need clarification. You can use a nail art brush for this but I just used the brush from the polish. It doesn't have to be super neat because you'll thicken up the outlines in the next step. Go over all of the lines you mapped out with your striping brush, making all of them equally thick. Use the same polish to fill in certain section like you did in Step 3. Create small diagonal lines on each side of the line from Step 6 for a leaf-life pattern. And that's it! It's a lot simpler than one might think and doesn't really require a lot of layering upon layering.